I wore Hubby's t-shirt yesterday. Upon seeing it, Daniel screamed, "Nani! NO! Ayah aju! Ayah aju! NO!" while tugging at the t-shirt. "Ala, Mummy pinjam je baju Ayah. Tak boleh ke? Boleh la yea? Pinjam jer.." He looked thoughtful for a second, and then nodded his head. Phuh! Nasib baik. Baru je nak jiwang-jiwang sikit dah kene sound...hahaha! 'Client is always right' is not always right. How can they be right when they showed no consideration when I told them that their ordered good was stolen from me before I could deliver them and they blamed me for late in delivering them their ordered goods? Do you think I PURPOSELY asked the effing thief to steal the goods? Huh? Don't you even think about my losses? That I need to fork out another RM1K to purchase the same goods for you! I know my responsibilities. I have placed the same order again as soon as possible and directed them to deliver as fast as they could. I am doing my part. Can't you even be a little more considerate? Where are your brain and your heart? And to top it all, we were friends! Seronok pulak main benda ni time tengah takde mood...hehe...thanks Nin! You are a confident, ambitious, and active person. You are also very radiant. You have a sunny personality. You are quite successful. You are a smart worker - not a hard worker. At times, you can be vain and cocky. You have a lot to be proud of. You are a very considerate person, but that doesn't mean you let people walk all over you. You spend a lot on clothes, and you tend to be a very stylish dresser. However, it's hard for you to throw away trendy clothes when they go out of style. In relationships, you tend to be very romantic and demanding. You'll treat your partner like gold, but you expect a lot in return. Yeah! I did that yesterday. Some evil hearted dungus had broken into my dad's car which was parked in front of my gate and stole a few things, including a carton of patch cords and connectors that I ordered from Singapore and supposed to be delivered today to a client. Lucky that they didn't take the bigger carton because if they had, I would need to fork out another RM6K to buy the stuffs again. I do not know what they want to do with the patch cords and connectors. Maybe they can sell them to my client? Huh? You ba@t%*rd! So, a detective and photographer came by not long after the report was lodged. My dad lost a briefcase containing his car's grant, a few shares certificates, cheque books and other documents. Mum lost about RM300. The car was in such a mess. It is uncommon for crimes to take place here where I live. What with the police station less than 1 metre away and also security company's guards patrolling the area. We'd suspect those patrolling might have something to do with this, but this is mere suspicion. After all, they are the ones who patrol and if they really DO patrol, they would have seen something amiss, right? 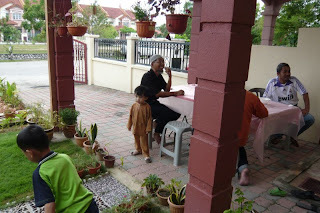 Some photos from my open house 2008, held on Deepavali holiday. More on my FB. 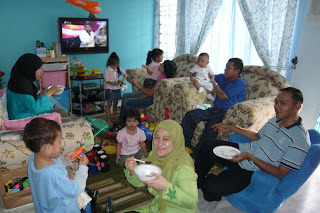 I hosted a session of open house for my cousins just the day before. So this year, I actually hosted a 2-day, 2-night feast! Sakan betul! hehe... Not to mention a cooking and makan session before that when my Hubby was still at home for a few friends and families a week before that. Am I a kitchen goddess or what? hahahahaha! Thanks to all who made it. 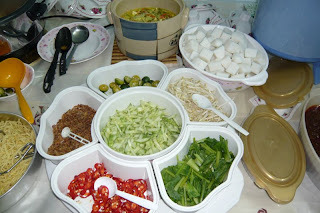 On the open house day itself, my Mum was the great life saver because she actually had to recook the curry mee three times because it was such a hit amongst guests. Last2 sampai santan pun dah habis, so we had to resort to beehoon soup! haha..
Walaubagaimanapun, ada juga senarai jemputan yang telah melukakan hati saya dengan gagal hadir tanpa sebarang sebab mahu pun khabar atau ucapan maaf. Sangat mendukacitakan ok? Terutamanya yang sangat rapat dengan saya sewaktu di universiti dan di sekolah menengah dahulu, yang telah berjanji untuk datang, dan gagal hadir lalu gagal memberi sebarang alasan yang logik dan boleh diterima pakai. Dan juga mereka yang telah diundang tetapi sangat malas untuk membalas SMS dengan sebarang jawapan sama ada akan datang atau tidak (tidak mempunya rasa courtesy langsung..hihi..courtesy cakap Melayu apa ek?) dan tidak menghargai jemputan. Saya telah mengenalpasti anda semua dan nama-nama anda akan digugurkan daripada senarai jemputan untuk acara-acara kelolaan saya di masa-masa akan datang. I mean, is it too difficult to reply to an invitation? As a courtesy to the host/hostess so that they can budget how much food to prepare? And don't tell me that you do not know what plans you will have on the day, especially if you are going to 'balik kampung'. You don't plan your balik kampung (especially the long distance ones), is it? Why must you wait until the event is over only you'd send the apology sms saying that you balik kampung? For me, when friends invite me to a certain event, it means that they still remember me. And as a gesture of gratitude for their thoughts, I would try my best to fulfill the invitation. Especially if it's a mean of meeting old friends whom I have never met or heard about in such a long time! What is petrol or toll prices or even distance compared to once in a while meetings? It is not that you do this every single day of your life, kan? But then again, it's just me. I just don't throw away old friends just as I get new ones..And I also do not ditch my friends when I have already got a family of my own.. So, my baby has grown so big already? Uniform: 2 pasang (RM50 sepasang). Exercises of Practical Life (e.g how to pour nuts, rice, water from one beaker to another, how to divide them into 2 containers and so on, how to carry chair correctly, how to handle pencils, how to write, how to trace shapes blabla… ) I also requested the teacher to toilet-train our beloved son..hehe..
Class time is everyday from Monday to Friday beginning at 8.30am till 3.30pm. School terms follow government school’s terms. Insurance included in the fees. I think it’s good. But I, like Izy, am also concerned of the long class hours. 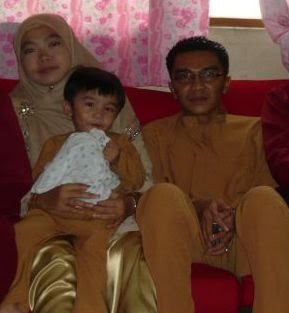 Takut Daniel boring when it's time to go to real school later sebab dari kecik asyik pergi sekolah aje..Any other thoughts from other parents? But when I asked him, Daniel go to school? He said NO, NO, NO…. 1) I love shopping (who doesn't, eh?) I am also an impulse buyer. I don't really mark my calender for sales dates, because usually I would splurge just after the sales ended. However, this does not imply that I have a lot of loots to spend..haha! 2) I don't like mismatched things. For example, I hate it when anybody else in the family match my son's milk bottles with different tops from other milk bottles (although they fit perfectly). I also get upset when the bottle cover went missing. I mean, REAL upset..
4) I think many women driver drive like #*%@. They just don't care about other drivers! They don't give way even when you signal and is close to hit a pole or something. They just turn into your lane from a junction, hoping that you would stop and give way, just because they are women. They drive slowly on the fast lane..and the list goes on and on. Although I am a lady driver, I am confident to say that I don't do these hateful things...hehe..